Below are a list of resources I have compiled that school counselors can utilize for supporting military children and families. 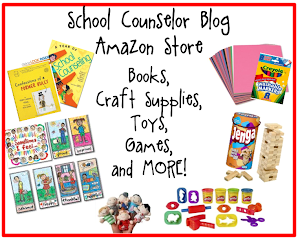 Please feel free to add your own favorite resources in the comment section below or share them on the School Counselor Blog Facebook Page or via email. "Best Day Ever" - Google Doodle image by a military child of father coming home. This image could be used in individual and small group sessions. Corner on Character blog by Barbara Gruener - Barbara has literally TONS of information for supporting military children and families. She also has posts about ways she supports our troops at her school! The Corner on Character is a great resource for all things school counseling and character education! 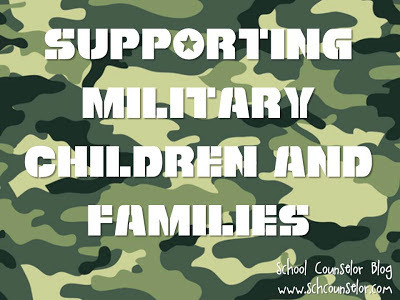 In Our Classrooms: Supporting Children of Military Families from Edutopia. Great article about ways to support military children. Military Child Education Coalition - This site has lots of information for working with military children. There is research and information on trainings and programs for educators. Military OneSource Deployment - This site has a wealth of information and resources. This is a great resource to use when working with military children and to share with families. Military Youth on the Move - Military Youth on the Move is a resource geared towards military kids. The site has information about moving, school, social life, and more. I love that this site has podcasts and videos! There are also resources on this site that parents and educators can use when working with students! National Guard Family Program - Lots of resources for the stages in military deployment. Information and resources for families and youth. Sesame Workshop: Military Families from Sesame Street. This site provides kid-friendly videos, facilitator guides, and guides for caregivers. Dealing With Deployment: A Small-Group Curriculum for Elementary and Middle School Students from the American School Counselor Association. This curriculum has resources and activities that could be used for individual sessions or small groups. Dear Blue Sky by Mary Sullivan - geared toward middle school. Novel about a girl whose brother goes to war in Iraq. Deployment: Strategies for Working with Kids in Military Families by Karen Petty, Ph.D.
Military Family Books - A GIGANTIC list of books that can be used when working with military children and families! 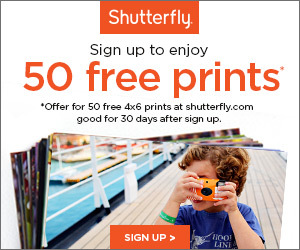 How do you support military children and families? Comment below, tweet, contact Danielle, or share on the School Counselor Blog Facebook Page! Danielle is a K-12 Certified School Counselor, Nationally Certified Counselor, and blogger at School Counselor Blog, a place where school counselors share innovative ideas, creative lesson plans, and quality resources. Connect with Danielle via email, Twitter, Pinterest, LinkedIn, Google+, and become a fan of the School Counselor Blog Facebook Page. 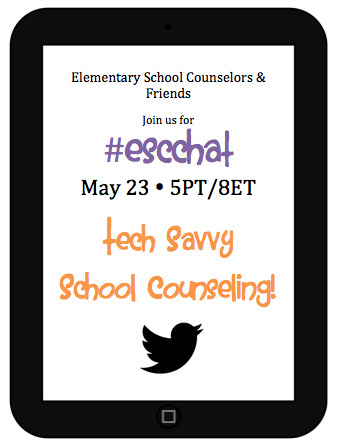 Tech Savvy School Counseling Elementary School Counselor Chat #ESCCHAT 5/23/13 at 8pmEST! There is a new tweet chat in town geared toward Elementary School Counselors! Carli Segal (@carlicounsels) author of Carli Counsels Blog started a weekly Twitter chat for Elementary School Counselors called #ESCCHAT Anyone is welcome to attend the weekly chats on Thursdays at 8pm EST. I am super excited to be moderating the Elementary School Counselor Chat (#ESCCHAT) this week on Tech Savvy School Counseling! So if you want to share ways you are tech savvy and learn more ideas, come #ESCCHAT with us on Thursday, May 23 at 8pm EST. For more information on participating in a Twitter Chat, check out this post Dr. Erin Mason and I wrote about #SCCHAT. Have you participated in a Twitter Chat? What is your favorite part about participating in a Twitter Chat? I have a new post on Free Spirit Publishing's Blog! In my latest post Advocating for Children Diagnosed with a Mental Disorder for Free Spirit Publishing's Blog, I share ways that you can make a big impact in the life of a child diagnosed with a mental disorder through advocating. How do you advocate for children diagnosed with a mental disorder? Please share your comments and ideas in the comment section of my post on the Free Spirit Blog! I started writing for Free Spirit Publishing's Blog in April of 2012. 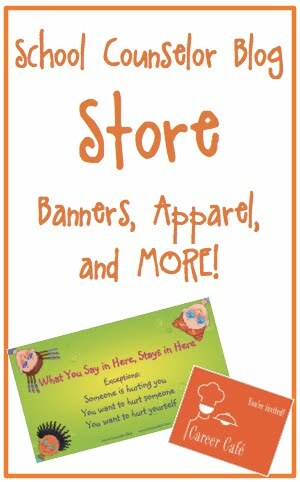 Check out the Counselor's Corner for more Free Spirit Publishing Blog Posts by me! I love Free Spirit's books and I am so excited to contribute to Free Spirit's Blog, "a springboard of ideas for teachers, counselors, and anyone who cares about kids!" I have a new post on Free Spirit Publishing's Blog! In my latest post Mental Health Awareness Month for Free Spirit Publishing's Blog, I share fun ways you can educate your workers about mental health and wellness. How do you support mental health and wellness at your school? What things do you do to take care of your own mental health and wellness? I am trying out Storify as a method to archive the School Counselor Tweet Chats. Let me know what you think! For more information about School Counselor Tweet Chat (#scchat) and transcripts of previous chats, visit http://bit.ly/scchat-info. 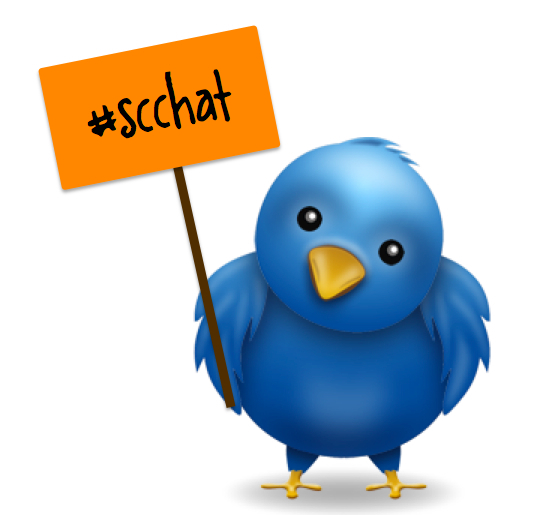 Our May #SCCHAT was held on Tuesday, May 7, 2013 at 8pmEST. The topic was iPads in School Counseling K-12. Andrea Burston (@andreajburston) moderated the chat. This transcript is chock full of iPad app recommendations and ways you can use iPads in your work as a school counselor. Check out the full chat transcript here! To access all of the tweets with the hashtag #scchat, click here. For transcripts of previous #SCCHATs, schedules for future School Counselor Tweet Chats, and information on how to participate, visit #SCCHAT Info: http://bit.ly/scchat-info. There is a lot of Twitter buzz building about the 2013 ASCA Conference (#ASCA13) in Philadelphia, PA! We plan to share information with you all soon about our second annual School Counselor Tweet Up, which is a great opportunity for you to meet and network in real time with your #SCCHAT friends! We are currently looking for future moderators and topics. If you are interested in moderating, please email me or direct message me on Twitter. Did you participate in the School Counselor Tweet Chat? What did you think about it? What new ideas did you learn? Comment below or share via twitter #scchat! Erin Mason is a former Middle School Counselor, now Counselor Educator who manages SCOPE, a group blog dedicated to chronicling the positive impact of School Counseling professionals. Connect with Erin via email, follow her on Twitter, add her on LinkedIn or Google+, and become a fan of the SCOPE Facebook Page. The next School Counselor Tweet Chat is on Tuesday, May 7, 2013 at 8pmEST. 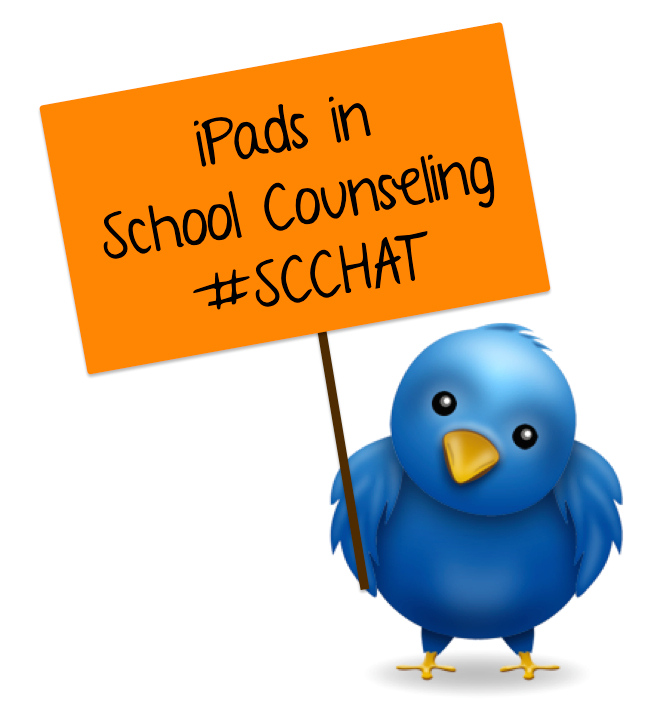 The topic for this month's School Counselor Tweet Chat is Andrea Burston (@andreajburston) from JYJ Counselor will be moderating the chat about iPads in School Counseling K-12. We will be chatting about how school counselors can utilize iPads in their work as school counselors at the elementary, middle school, and high school level. Come ready to share your favorite apps and how you use them! You will learn lots of ways you can use the iPad in school counseling! We look forward to tweeting with you! Join School Counselor Blog and SCOPE for #scchat the first Tuesday of the month @ 8pmEST! For transcripts of previous #SCCHATs, schedules for future School Counselor Tweet Chats, and information on how to participate, visit #SCCHAT Info: http://bit.ly/scchat-info. If you are interested in moderating a future School Counselor Tweet Chat, direct message me on twitter! Dr. Erin Mason is a former Middle School Counselor, now Counselor Educator who manages SCOPE, a group blog dedicated to chronicling the positive impact of School Counseling professionals. Connect with Erin via email, follow her on Twitter, add her on LinkedIn or Google+, and become a fan of the SCOPE Facebook Page. I am running the Pittsburgh Half Marathon as a Girls on the Run SoleMate benefiting Girls on the Run Magee's Women's Hospital in Pittsburgh, PA.
Last spring I had the opportunity to serve as Girls on the Run coach at my school. It was such an empowering and rewarding experience for everyone involved. Girls on the Run (GOTR) is a non-profit organization that "inspires girls to be joyful, healthy and confident using a fun, experience-based curriculum which creatively integrates running." Coaches teach a 10-12 week curriculum that focuses on body image, self-esteem, relational aggression, nutrition, wellness and other topics relavent to adolescent girls. All of the activities have a component of physical activity or running. The Girls on the Run program culminates with a 5K event. To learn more about Girls on the Run check out the Girls on the Run website and watch the video below! I would love to answer questions you may have about hosting a Girls on the Run program or any other specific questions. I plan to do a follow up post about running the Pittsburgh half marathon as a SoleMate and answer your questions about Girls on the Run. Have you hosted a Girls on the Run program at your school? April showers... BRING MAY FLOWERS! Spring has finally sprung where I am in Pittsburgh, PA! Temperatures have been in the 70s this week and I hope that sping is here to stay! Even if it spring hasn't sprung yet where you are, here are a few ways you can brighten things up by bringing May flowers into your School Counseling office and activities. In a recent post for the Free Spirit Publishing Blog I shared about a lesson I did that I called "Growing Respect." This lesson is an example of how you can use concepts that children and adolescents already understand to teach new information. I used the concept of how a flower grows to teach students about growing and nurturing respect. I took this lesson a step further for a girl's group. We talked about growing respect and then planted sunflowers I purchased from the dollar spot at Target. Students enjoyed watching the progress of their sunflowers' growth throughout the group. It was a great visual for talking about how much they themselves grew in group too! Emily's Kindness Garden was one of the first posts featured in the School Counselor Spotlight. I absolutely loved that Emily created this great bulletin board to spread kindness in her school. It is bright, cheery, and has a great message! Check out Emily's post and learn how to create a Kindness Garden at your school! Since I had lots of artificial flowers leftover from my bridal shower, I decided to give making flower pens a try. I thought flower pens would be a super cute, functional addition to our Career Cafe tables. I had so many that I kept a vase of them in my office and used the rest for Career Cafe. Students loved them and it was a great way to keep track of the pens! Check out the video below for instructions on how to make them! Has spring sprung where you are? How do you bring flowers into your work as a school counselor? 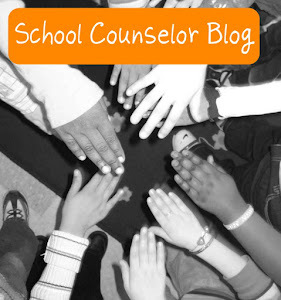 School Counselor Bloggers I love! School Counselor Blog by Danielle Schultz is licensed under a Creative Commons Attribution-NonCommercial-NoDerivs 3.0 United States License. FableVison and North Star clip art copyright by Peter H. Reynolds http://www.fablevision.com/. Discovery School clip art licensed from the Clip Art Gallery on DiscoverySchool.com.